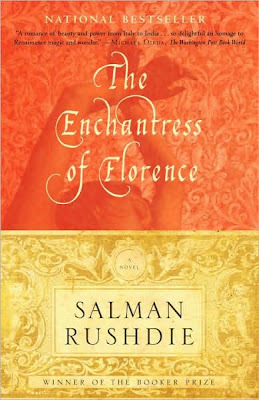 An edited version of this article was first published as Book Review: The Enchantress of Florence by Salman Rushdie on Blogcritics.org. Wow. Perhaps this is one of those books in which I would go out of my way and recommend to other people I meet. It’s just a gem of good writing, and the reader would definitely be put under a spell as he reads this magnificent piece of work. This is the second book of Salman Rushdie that I have read, and I actually am glad that I picked this up in the bookstore. Like The Satanic Verses, I have enjoyed reading this one as well. But first, let me give a little description about the contents of this book. This book tells the tale of Niccolo Vespucci, a golden-haired wanderer who happens to visit the royal court of Emperor Akbar, the ruler of the Mughal Empire. The setting is Fatehpur Sikri, and Vespucci seeks an audience with the emperor to tell him a story. This story is intricate, and concerns a relative of the Emperor, which, if true, will make the Italian visitor more than a simple visitor. As I have mentioned above, the Italian visitor has a story to tell, and this is told to the reader as well. Thus, this is a book that contains a story within a story. This is where the enchantress of Florence appears. 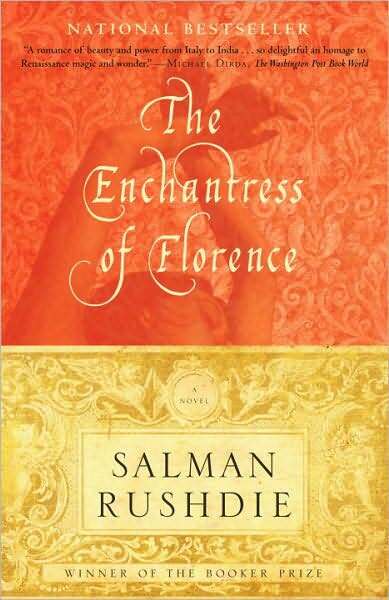 The enchantress turns out to be a lost princess, originating from the royal Mughal court, but somehow, due to wars and battles that were won and lost, this princess was passed on to various different kingdoms until she eventually ends up in Florence. I have decided not to give a more detailed synopsis here, for various reasons. First, the story is very complicated, and I’d rather not portray something that is incorrect here. I’d rather leave the pleasure of reading it to the reader who might pick up this book due to this review. Second, the story is written in a post-modern style, employing the frame narrative. Every chapter is a story in itself, and each chapter functions as a little piece that belongs to a larger scenario. Instead of narrating the story in a linear unidirectional fashion, where the end of one chapter is the beginning of another chapter, the frame narrative actually engages the reader, as I always found myself flipping back to previous chapters I have read trying to integrate the current chapter, seeing how these two pieces of the puzzle fit together in the grand scheme of things. Third, there’s also the element of magical realism. There’s plenty of fantastic and magical things that happen in this book. Things that if taken literally, it would definitely not be possible. Perhaps that is the charm of Salman Rushdie, as I remember The Satanic Verses to be written in a similar fashion, employing magical realism and frame narratives. Fourth, I appreciated the amount of research that Rushdie has put into this book. The end of the book contains a bibliography of several books and other historical resources about the Mughal Empire, and about the Florentine Republic. Several real-world characters have appeared in the book, including Amerigo Vespucci, Niccolo Machiavelli, Emperor Akbar, Lorenzo de Medici, and so on. This book feels like history, and yet as Joyce Carol Oates has said, it is “jubilantly mixed with postmodernist magic realism”. I agree. Fifth, I also like the way it was structured, in that the climactic point of the book wasn’t the last thing that the reader encountered, thus ending the book abruptly. It was also not the case that another minor conflict appeared after the big climax, as in The Return of the King, which resulted in a rather anti-climactic finish. Instead, the climax was followed by a rather elegant finish, as the author slowly yet surely untangled all the puzzles that still remained in the reader’s head. Once I read the climax, I had this feeling that the book was going to end, and yet I was still kept on the edge of my seat. I liked the fact that the answers to the lingering questions were slowly revealed, and that everyone, including the characters in the book, were also wrong in their assumptions. In the end, the author had the final card, as Rushdie once again showed his superb story-telling prowess. It took me about four days to finish this novel. In my rate, that’s rather fast. But there is a reason for the speed, and that’s because this book is definitely an enchantress, as it rarely allowed me to put the book down. I definitely recommend this to anyone who enjoys a book that actually engages its readers. Passive readers shouldn’t pick this one up. Instead, those who are intelligent and willing to take the challenge of entering the world that this book paints should pick this up. Reading this book is like solving a jigsaw puzzle, where the book gives you one piece at a time, and it’s up to the reader to piece them together, finally revealing the whole picture at the very end. I wholeheartedly give this book 5 out of 5 stars.